It’s not too surprising that the designers opted for such an elegantly traditional look for the royal nursery. However, Oliver Burns added a lovely touch of whimsy in the umbrella addition to the chandelier, which evokes images of Mary Poppins! The room has a nostalgic feel, aided by the narrow stripe wallpaper, wall lamps, and the vintage style dressers lined along one wall. 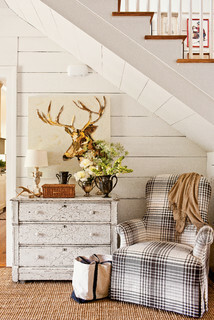 The dressers add a touch of retro character to the room, rather than modern built-in closets. This is another very traditional idea for the royal nursery, designed by Guy Goodfellow. Guy Goodfellow interior design company in London is famous for its restoration of period houses with classic interiors. Their rather posh clients include the Duchess of Marlborough and Lord and Lady Dashwood, so they probably have a good idea of the type of decor that will suit Kensington Palace! The wallpaper in this design is by Alexander Beauchamp, with 18th century scenes of Hyde Park. The park surrounds Kensington Palace where the baby will live in the same apartment where his father Prince William and uncle Prince Harry were raised. Keep the colors in the decor fairly pale and elegant. There will be plenty of time for bright primary colors when the child is a little older and running about. Pale tones convey a vintage mood and are more restful for mother and baby to create a sanctuary together for baby’s first years. The designers of both of these nurseries opted for flowing, floor-length drapes and a deep pelmet. That window treatment immediately conjures a traditional and relaxed air for a nursery. A few details like pretty vintage chandeliers, a rocking chair, or chests or dressers to hold baby’s clothes also create a vintage mood. A large framed antique or reproduction mirror on the wall reflects light into the room and adds to the traditional design, and a vintage dressing table with a looking glass for mom can achieve the same effect as well as being practical. Old-fashioned toys immediately encourage a sense of nostalgia, making the nursery a place where everyone wants to play! A rocking horse is the classic nursery toy, as well as teddy bears or a doll’s house or train set tucked on a shelf. Perhaps you have some heirloom toys from your own childhood to share with the new baby? Of course, a four-poster or canopied crib with swathes of lace is the bed of fairy tales and is sure to add a traditional and regal touch. Every baby is a prince or princess and I hope you’ve enjoyed some of these inspirations for your very own royal nursery! This entry was posted in Home Design Ideas and tagged child's bedroom, children, decor, design ideas, interior decor, Nursery on July 17, 2013 by admin. 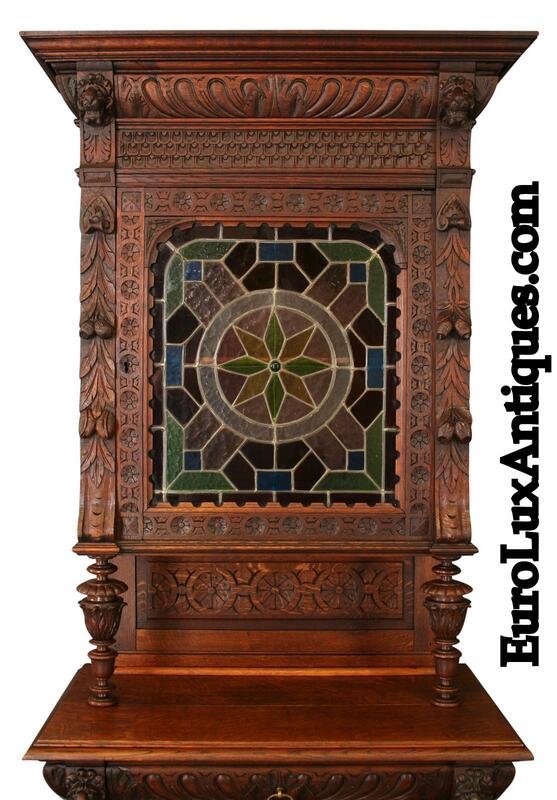 I rarely shine the spotlight on just one item from the EuroLuxAntiques.com gallery, but this fabulous Louis XIV armoire has such a great story behind it, I’m excited to share it with you. 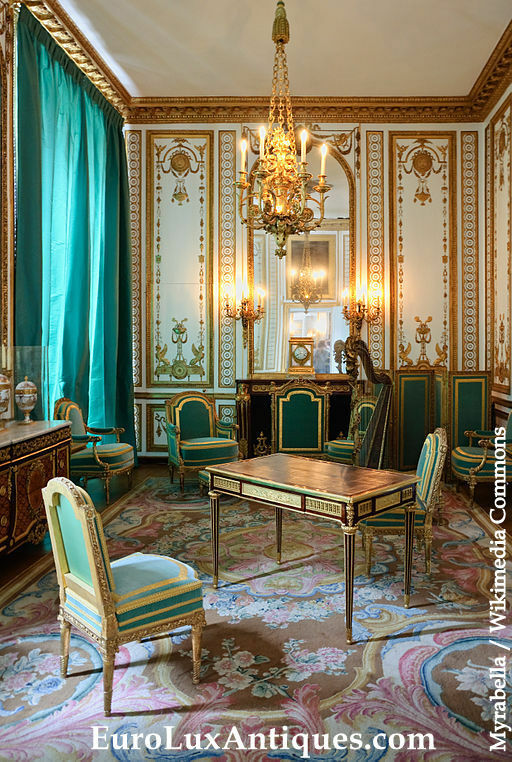 The walnut Louis XIV armoire dates to 1710, and was owned by the late movie critic, Gene Siskel. 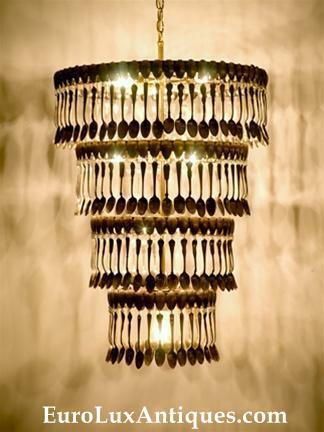 He hand-selected it for his home at the prestigious Biennale de Paris art festival in France. Greg and I were deeply honored that Mr. Siskel’s widow chose to trust the armoire to us – it’s on consignment now in our gallery. 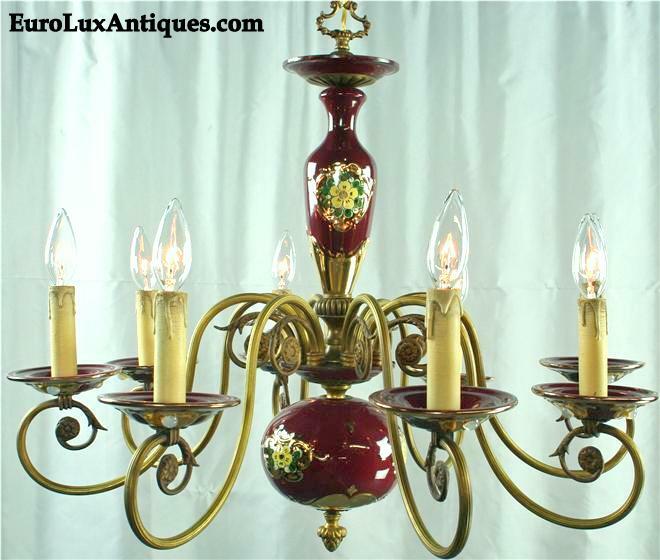 Just imagine: This French antique was crafted more than three centuries ago when King Louis XIV, also known as the Sun King, was on the throne of France. 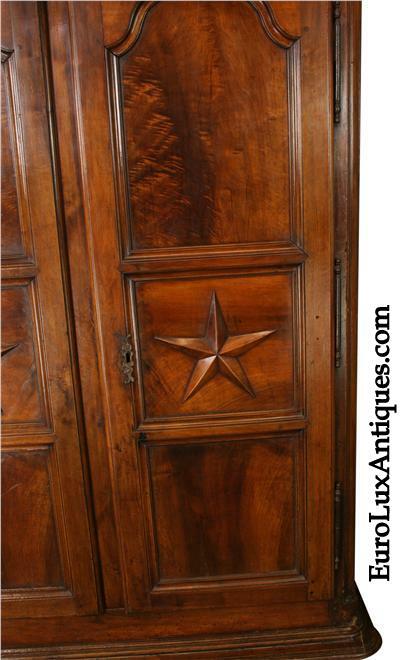 It’s an extremely impressive cabinet with a rich patina on the walnut wood and a striking star design in relief on each of the two doors. 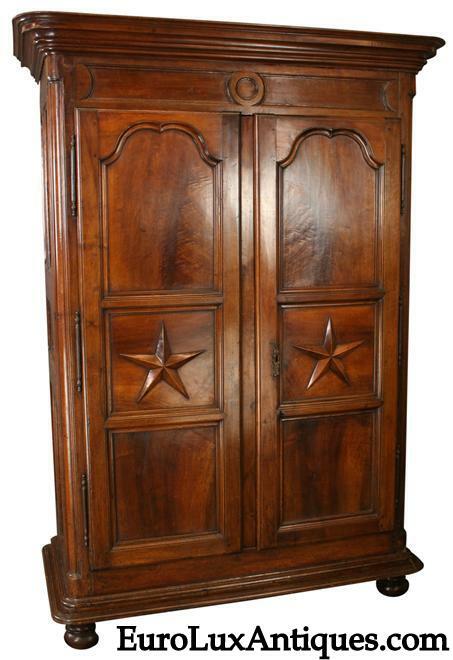 It’s a star-studded armoire in every sense! Here’s a close-up of those stars on the doors – or étoiles in French. 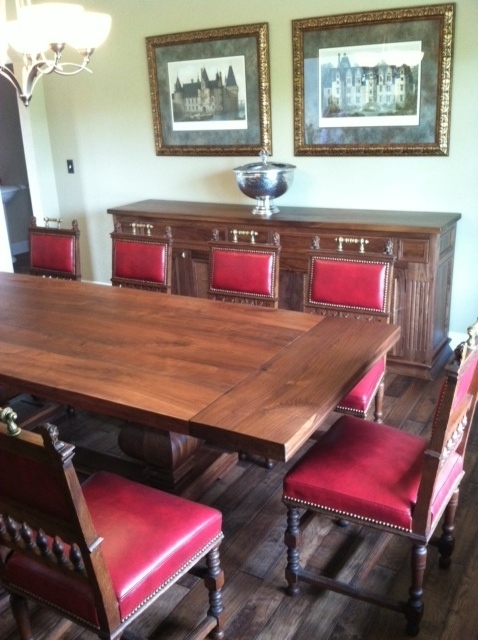 You can really see the beauty of the walnut wood grain and patina. The timeless elegance of the Louis XIV armoire means that it would look perfectly at home in either a contemporary setting or in more traditional decor, surrounded by other antiques. Of course, it would also be a great conversation starter when guests visit and you tell them about its unique history. 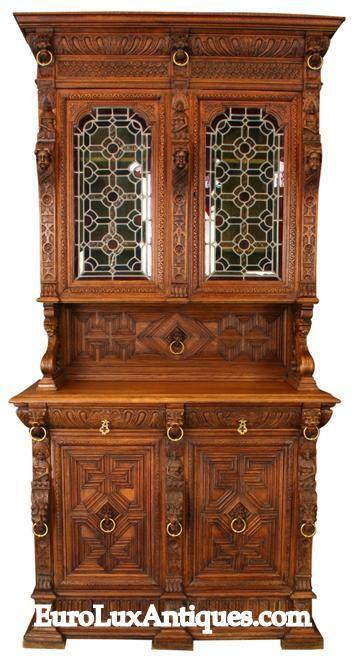 At nearly 7.5 feet high and more than 5 feet wide, the large armoire makes quite a style statement. 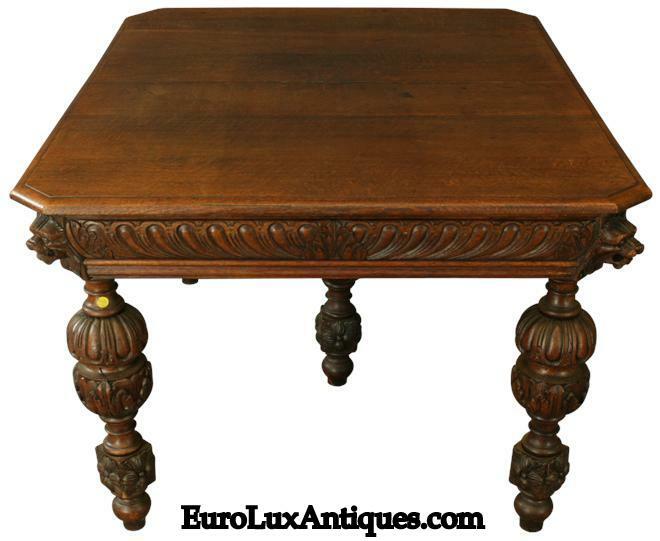 The deep crown molding is exceptionally fine and the armoire rests on handsome bun feet. But let’s not be so swept away by beauty that we forget about function! 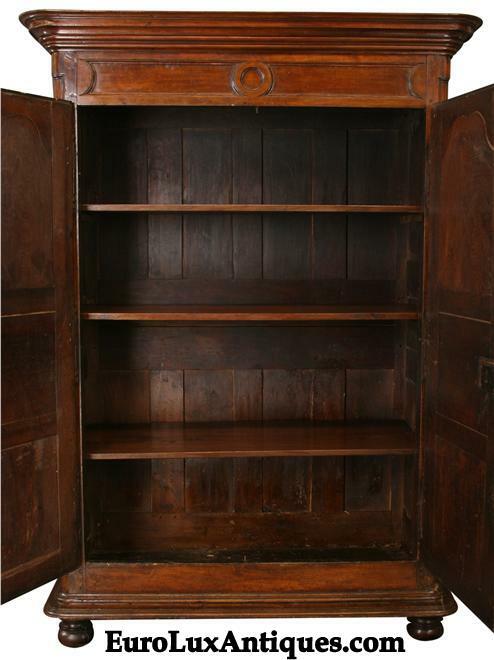 The shelf space inside the large armoire provides plenty of room to store your treasures, whether you use it for family keepsakes, your best linens or your favorite cashmere sweaters and scarves. 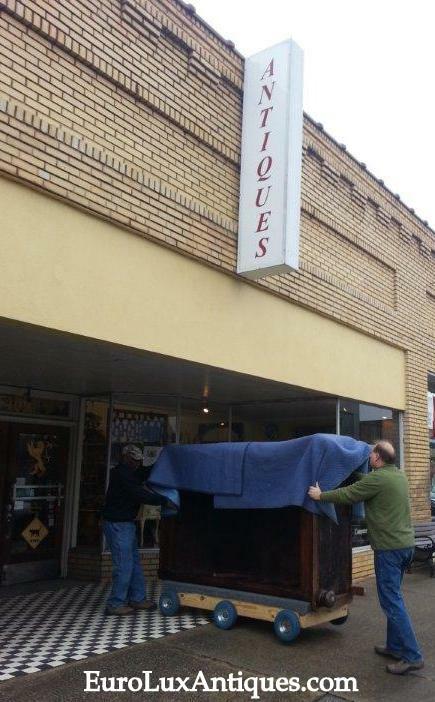 Here’s a photo of Greg and Frank moving the wonderful period Louis XIV armoire into the gallery – drive it carefully boys, it’s precious cargo! Greg and I are movie buffs and we grew up watching Siskel and Ebert, so it is especially wonderful to help find this exceptional armoire a new home. If you’re interested in owning this historic antique and adding the next part of the story to its journey across three centuries and two continents, you can see more details about the Louis XIV armoire at our website. In any case, I hope you enjoy the photos and the story behind it as much as I do! 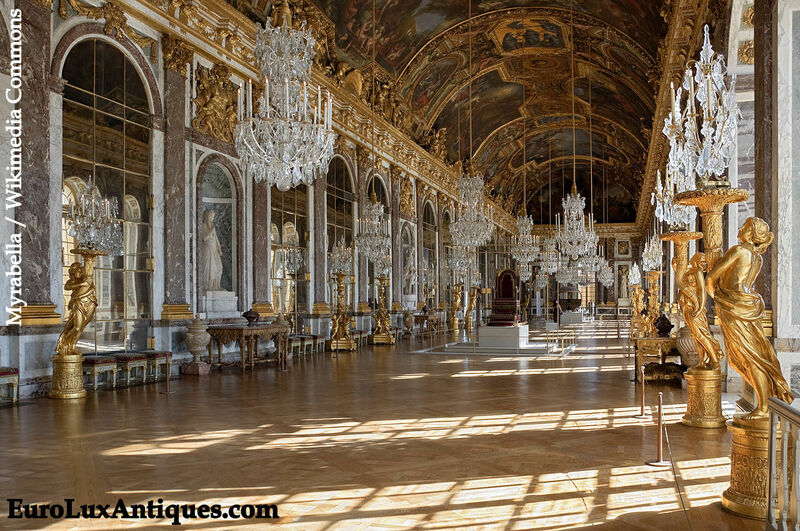 This entry was posted in Antique Furniture and tagged Antique Furniture, armoire, EuroLux Antiques, French Antique Furniture, French Antiques, Louis XIV on July 9, 2013 by admin. 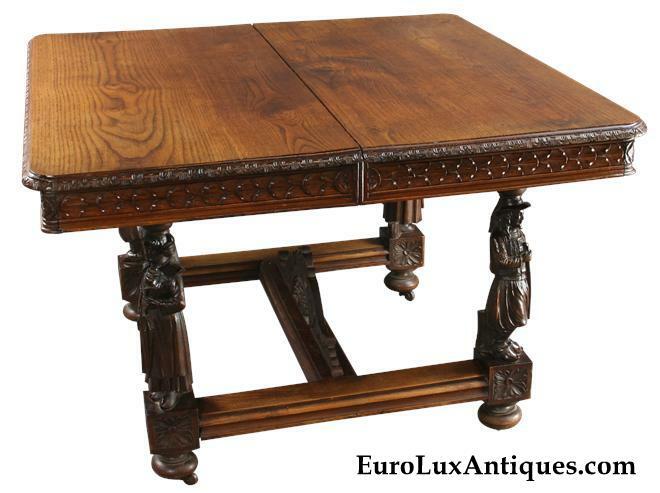 We hope that when our customers buy fine antique furniture, vintage home decor accents, and high-quality reproductions from EuroLuxAntiques.com, those treasures will become family heirlooms! 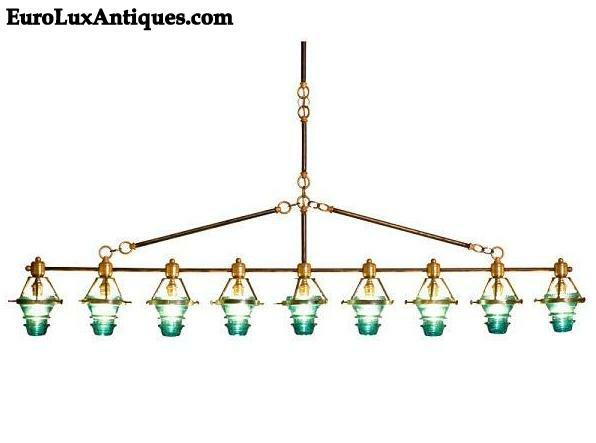 Heirloom pieces always have a story to tell, and they add so much character to a home. 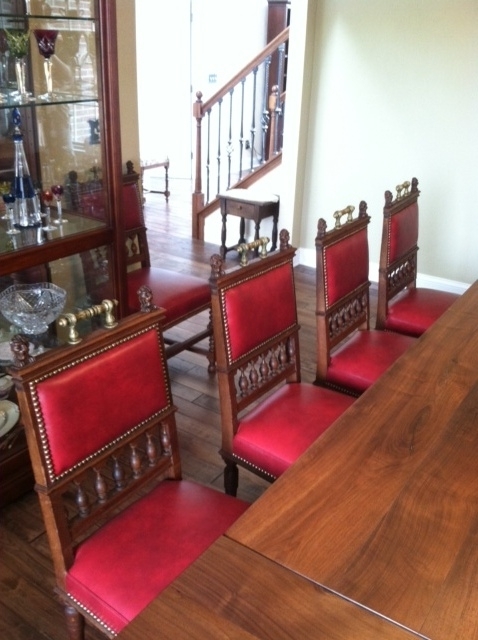 Greg’s parents John and Kathy have been hunting out their own family heirlooms to share with us. 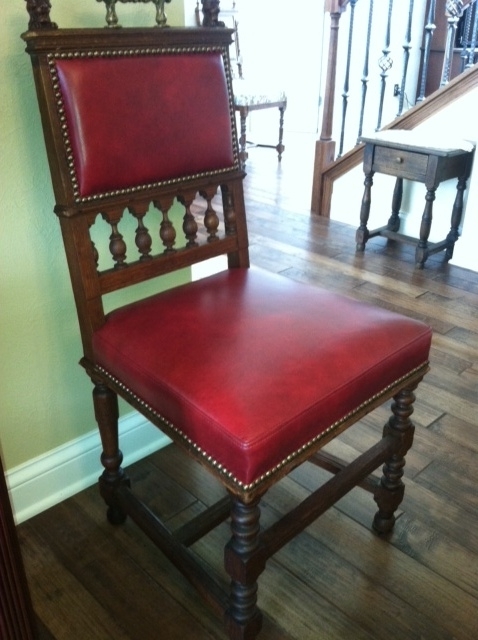 John is our genius accountant and gallery greeter, and this child’s chair once belonged to his paternal grandfather. 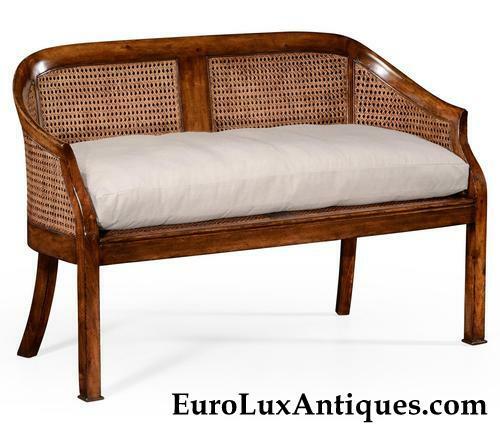 It is about 130 years old and was originally a rocker. As a child, John had a lot of fun turning the chair upside down and using it as a “plow.” Farming was what he knew, so farming was part of his play! You can see how the finials on the top and the ends of the arms are worn down due to his diligent farmhand efforts. This German enamelware coffee set was purchased in Germany in about 1954 by John’s dad, who was in the military. (John followed in dad’s footsteps, and flew P3 Orions in the US Navy.) 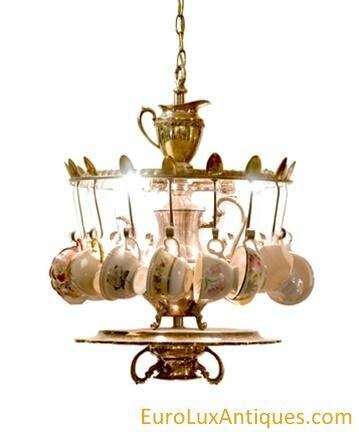 Supposedly, the coffee set was an antique already when John’s father bought it as a gift for John’s mom. This handsome walking cane belonged to John’s great-great-grandfather, John William Talbott, who was born in Kentucky in 1831. His initials are engraved in the top of the handle, making it a very personal family heirloom. I bet this cane has some stories to tell about the places it’s been and the changes it’s seen over more than a century. Kathy is our Director of Restoration Services. 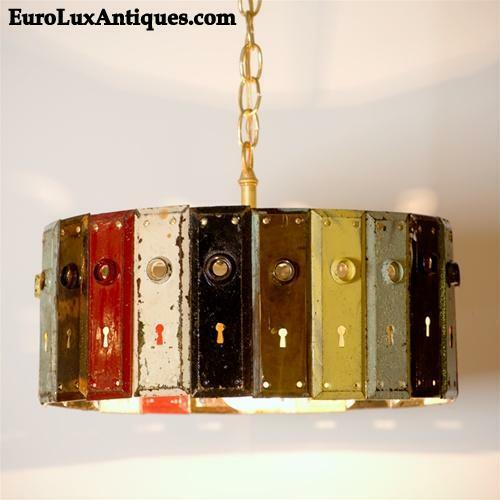 She’s a wizard at rewiring our vintage chandeliers, touching up furniture and restoring ceramics! This pretty cream pitcher belonged to Kathy’s maternal grandmother who said her family brought it to America when they came over from Germany. It’s marked ‘Bavaria’ on the bottom. Obviously Kathy’s grandmother treasured it. “She had it and took special care of it as long as I can remember,” says Kathy. This Confederate Bond is also a family heirloom from Kathy’s grandmother. “It was kept in her cedar chest and she would take it out and show it to me when I was a child,” says Kathy. Grandma promised Kathy that she could have it when she grew up. And so it came true! 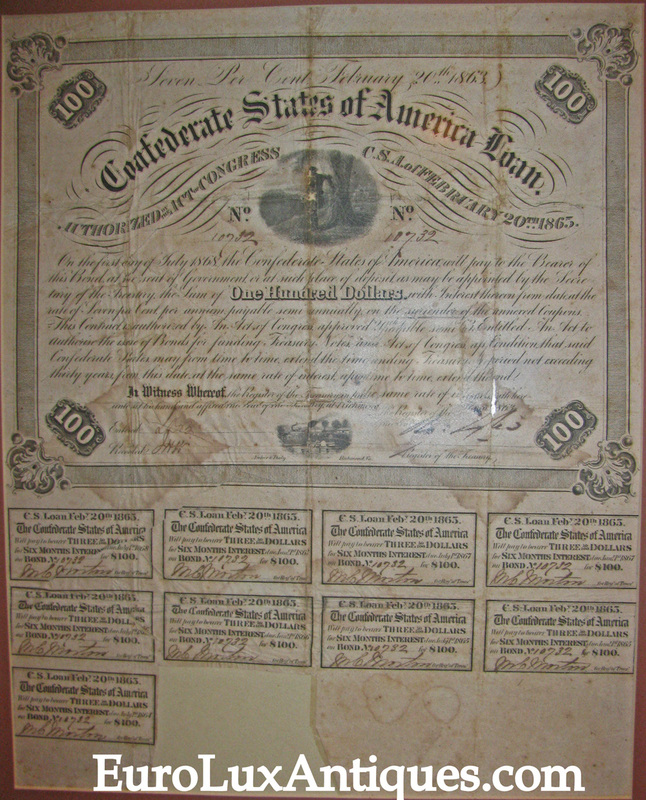 Although it was just a folded piece of paper when Kathy received it, she had the Confederate Bond mounted and framed when she lived in Florida in about 1968. Someone in Kathy’s maternal grandfather’s family made this chest of drawers. Kathy recalls it in her grandparents’ bathroom as far back as she can remember. 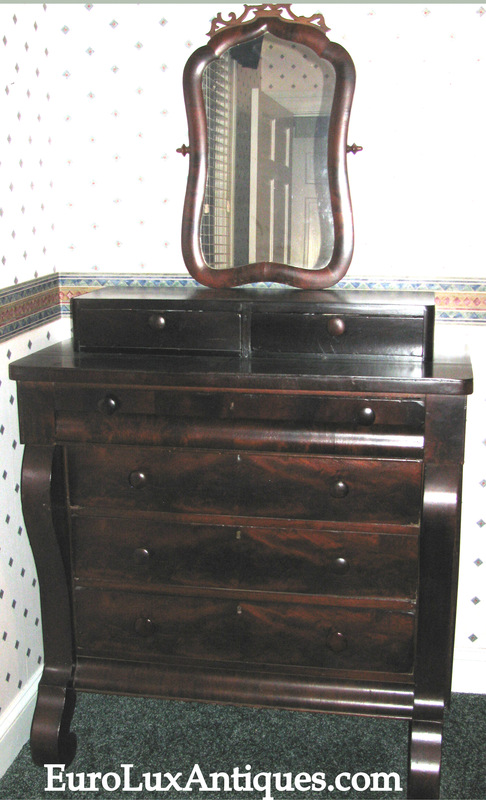 They used it to hold towels and other linen, and the small drawers at the top were dusty with bath powder. The chest of drawers continues to be a very special piece of furniture to Kathy. 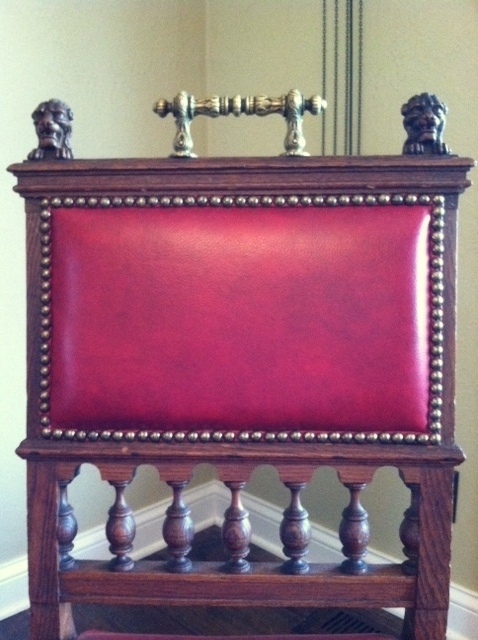 Do you have a family heirloom that you especially treasure? Tell us about it in the comment box below! 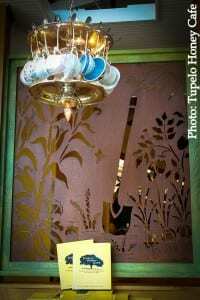 This entry was posted in News and tagged Antique Furniture, heirloom furniture, heirlooms, living with antiques on July 6, 2013 by admin.